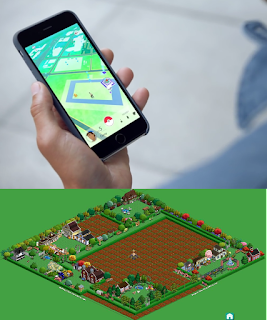 Pokémon GO meets FarmVille: players walk around in the real world, where real world locations have in-game roles. The players grow crops, and harvest them, and since this is the real world - they can 'own' land. Each player can "own" portions of land in the real world, and use it to grow crops. Crops can be sold in markets, which are also places in the real world (kind of like PokéStops). Land can be bought and sold, workers can be hired, however, a player must visit his/her land often enough, otherwise it becomes abandoned, in which case other players can buy it cheaply. The latter is crucial to the game, as it plays to users habits (making it easy to buy and maintain land next to home / work, or on the way there), and prevents early adopters from hoarding land. Each player starts the game with some in-game money, no workers, and some basic seeds (wheat, corn, or rice, depending on the climate). Walking around in the real world, the player can see which pieces of land are available for buying, and for how much. Abandoned pieces of land are priced by their size, and the price of land owned by other users is determined by that user, who can also choose "not selling". Any player can bid for any piece of land they pass by, as long as they have the money. Selling land does not require the player to be present at the spot. Having bought a new piece of land, the player has to work the land and prepare it for seeding. If the player has hired workers - they can be left there to do the job, but otherwise - the player has to stand close to the land for a minute, tapping the screen of the mobile device, thereby "working the land". Seeds for various crops can be bought at any market and planted in the land, requiring the player to visit the land in order to do so. Similarly to FarmVille, the crops take time to grow, and can rot if not harvested in time. Harvesting, like any type of work on the land, can be done by the player standing next to it and tapping the screen, or by workers left there for that purpose. These are places in the real world, that play a part in the game but cannot be bought or sold and are determined by the system, similarly to PokéStops. Standing close to a market, a player can buy seeds, machinery, sell crops, and hire workers (for a predetermined time) with various levels of expertise. Crops can be grown only in places where the weather makes sense for it to happen, or in greenhouses, and real-world weather affects the virtual crops and their prices, so a storm may kill some of the crops, but raise prices. Players advance through levels through experience points that are gained by playing the game (growing crops, buying land, harvesting, hiring help, etc.). Various achievements can be unlocked, such as managing 10 workers at once, growing exotic crops, owning a lot of land.